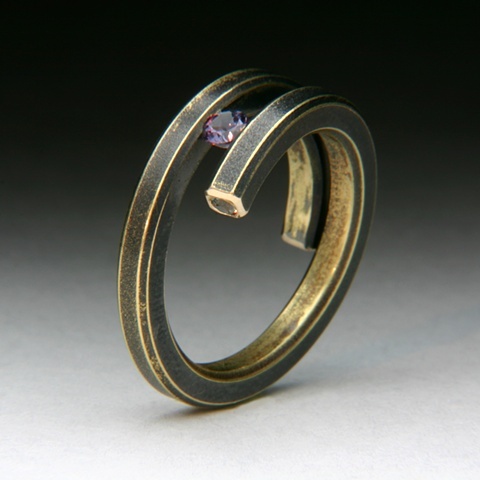 Bi-Pass Coil 14 karat yellow Gold Ring tension set with a Color change Garnet and a hidden end stone - color change Garnet. The gold has been fire oxidized, which will change with wear. The high spots will become bright yellow gold and the recess will remain black. Stones: .30ct 3.2mm Color change Garnet, hidden end stone is a 2.2mm color change garnet. Ring size: 7 1/2 - convo me about sizing. This ring has sizing limitations and an additional fee for sizing. To purchase this ring click on the price and it will take you to Paypal for checkout. This ring is sold please contact me if you are interested in have one made for you. International buyers please convo me regarding shipping out of the USA.